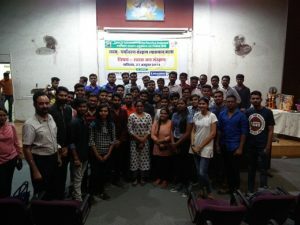 Civil Engineering Students attended Lecture Series on 9th Paryavaran Sanrakshan Vyakhyanmala 2018 at Preetamlal Dua Sabhagrah, Indore on 27th – 29th Oct 2018, Saturday (27th Oct 2018) for BE CE-III Yr and Monday (29th Oct 2018) for BE CE-II Yr. 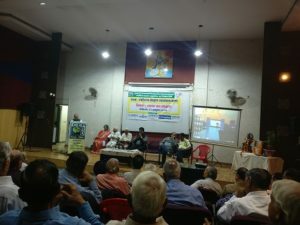 This awareness programme on “Clean Water Conservation” was organized by CEPRD (Centre for Environment Protection Research & Development) which is a voluntary NGO which came into being on 6 June, 1996 on 27th October 2018. An expert lecture was delivered by Shri Madhav A. Chitale, Ex Secretary General, International Commission (Irrigation and Drainage) on “Conservation of Clean Water”. Dr. Chitale has played a major role in getting India’s decision-makers and strategic planners to think of water as a resource whose quality and availability need to be safeguarded. He was honored with the degree of Doctor of Science (Honoris Causa) by the Jawaharlal Nehru Technological University, Hyderabad, in 1989, and Stockholm Water Prize in 1993 for his contribution to the conservation of the world’s water resources and public education programs. Shri Ullhas Paranjpe was also present on this occasion and he is devoted for the conservation of water and rain water harvesting since a long time. He explained the importance of “Conservation of Water” and “Rain water Harvesting” system. Various techniques of Rain Water Harvesting was explained to the audience.